Back when I was attending SFU, I would often leave the campus for food. Yah, not a stretch as I wasn't that enthused about the Sheppard's Pie special nor did I want to eat Triple O's 5 days-a-week. Yes, that was also before they opened up a slew of new restaurants near the parking lots. More often than not, Rich Guy, Aussie and I would sample the restaurants down the hill, while in the process be very sleepy for our afternoon classes. 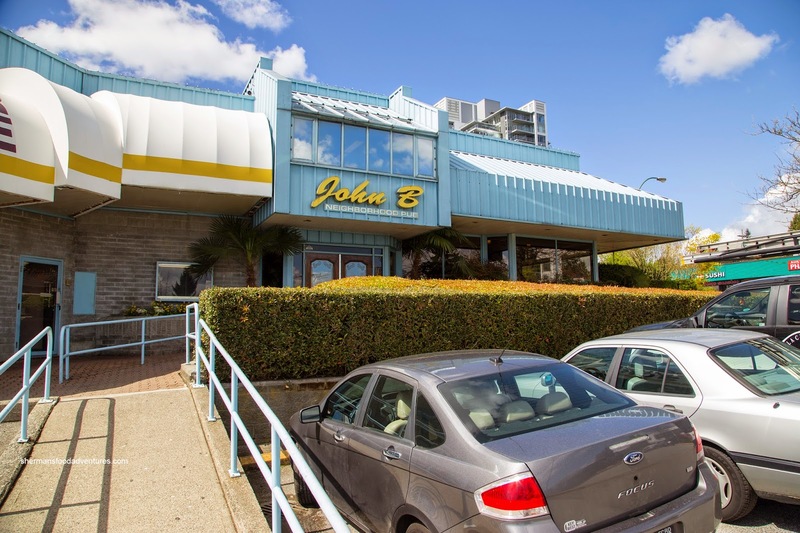 One place we would frequent was John B and their popular cheap wings. Well, I decided to go back to the well as we needed a place in Coquitlam to eat after Friday night hockey. Why Coquitlam? Well, Ginseng and Ginger were joining us and seeing how they live in the neighbourhood, we decided to head out their way. 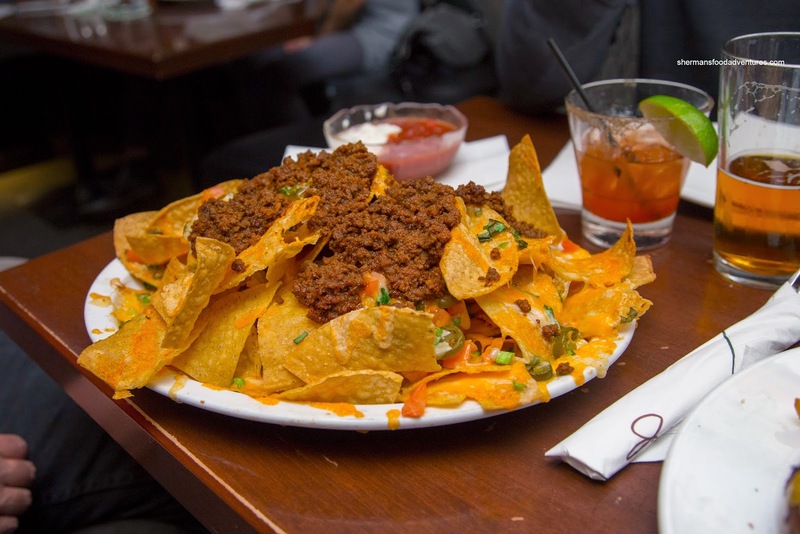 We ended up sharing a plate of their Nachos with beef and a giant bowl of sour cream and salsa. This was a large plate of food with plenty of crispy chips (even with the beef on top) topped with melted cheese, moist spicy beef, diced tomato and green onion. 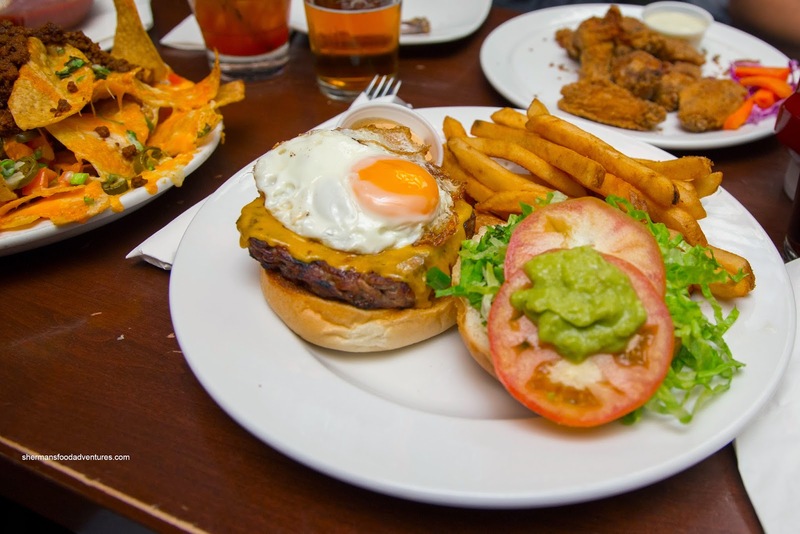 For myself, I decided on the Egg-cellent Burger with charbroiled beef patty, fried egg, cheddar cheese, chorizo, lettuce, tomato, onion and guacamole. There is something about a runny egg that adds a messy deliciousness which really appeals to me. In this case, it added more moisture to a patty that was not dry nor moist. It was smoky from the charbroil while the chorizo offered up some spice. The side of fries were pretty ordinary, but crispy nonetheless. Milhouse was waffling back and forth between a pot pie and a burger, yet ultimately settled on a Rueben. 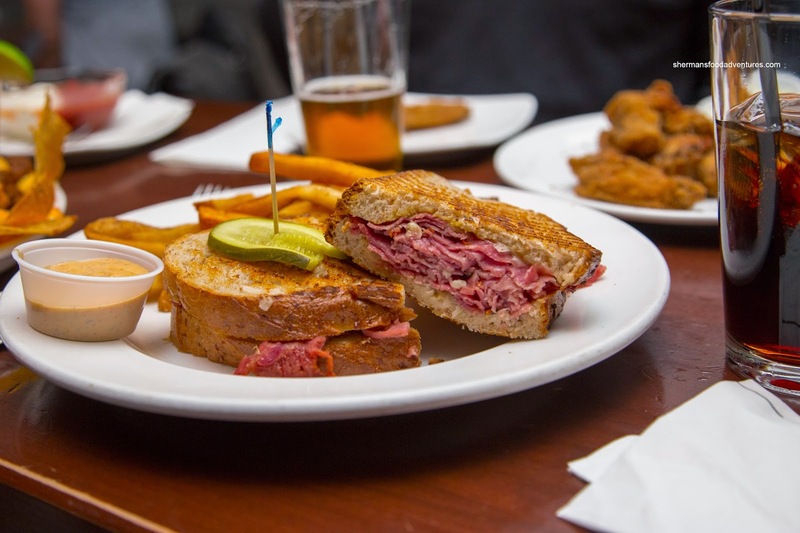 It was comprised of corned beef, sauerkraut, Swiss and Dijon on rye bread. No, not particularly exciting in the grand scheme of things, but it was alright nonetheless. There was a sufficient amount of corned beef while the bread was toasted up nicely. Interestingly, Ginseng had the Salt & Pepper Wings which were dry and lacking in seasoning. However, on a return visit with Big D, we had the same dish and it was pretty good. I guess like with anything, there are variables which may lead to a lack of consistency. Whatever the case, the wings we had were crispy while moist on the inside. 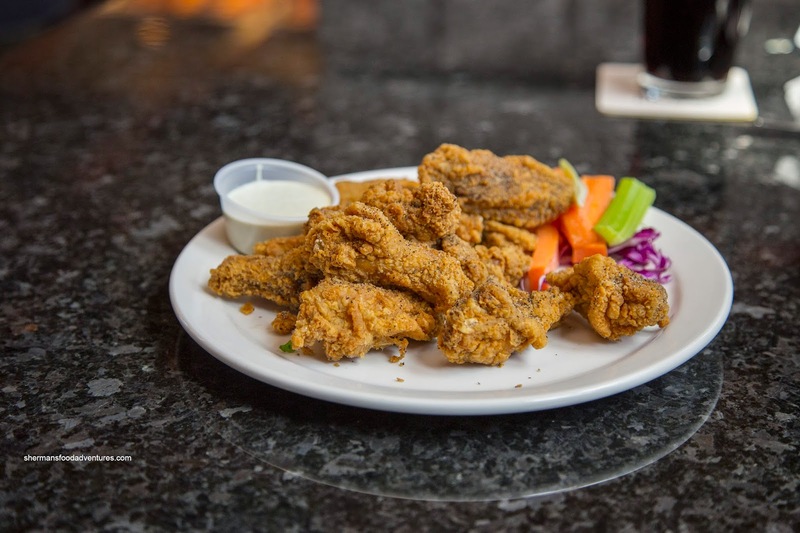 There was ample cracked pepper to give the wings a slight kick. 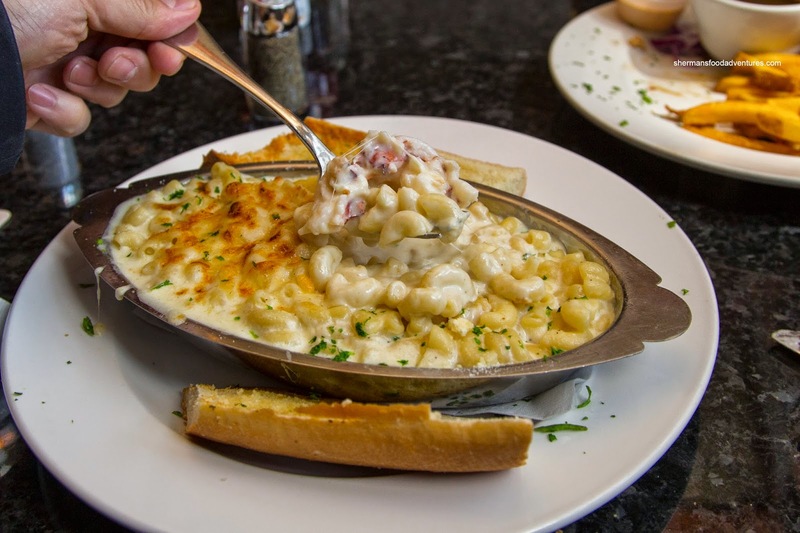 One item that caught my eye the first time was the Lobster Mac & Cheese au Gratin. I didn't mess around and ordered it without hesitation. It turned out to be pretty decent as the whole thing was creamy and cheesy. There were 4 reasonably-sized pieces of lobster (that were not overcooked), nestled inside the not-overly-soft noodles. Although the dish itself was on the wetter side, the sauce did tighten up as it cooled. 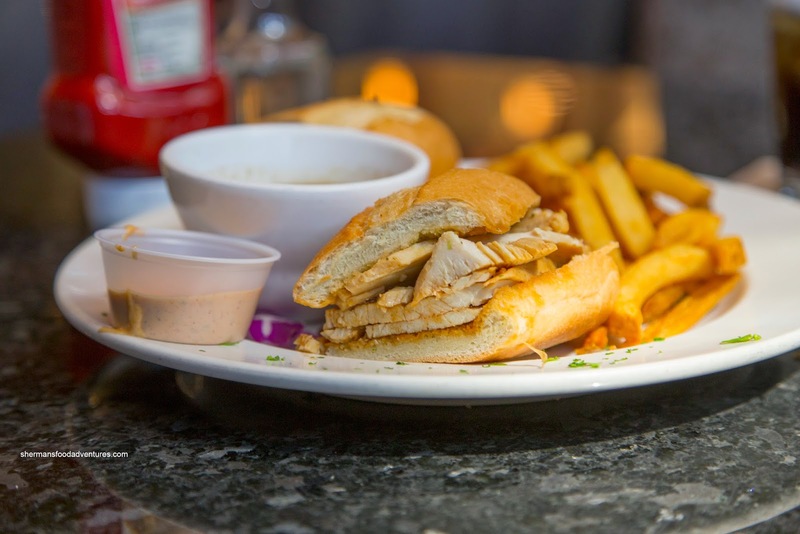 Big D elected to go a bit healthier with the Turkey Dip accompanied by BBQ au jus and fries. Predictably, the meat wasn't exactly succulent (nor should it be either), but it wasn't super dry either (they could've sliced it thinner and added more of it). The dip was sweet and smoky, going well with the turkey meat. As you can see, the food ain't gonna blow your mind, but from our 2 visits, John B produced acceptable food to go with our beverages.